Melanie Li, Manager – Corporate and Community History at the Hong Kong Heritage Project has kindly given permission for the following script and images to be used on our website. The image captions came with the photographs. 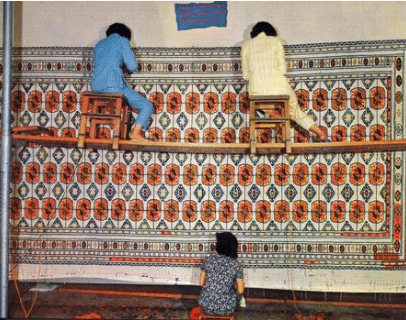 In 1956 a group of businessmen founded Hong Kong Carpet Manufacturers Limited with the aim of providing much-needed employment for Hong Kong’s burgeoning population, and to cater to the booming U.S. consumer market. 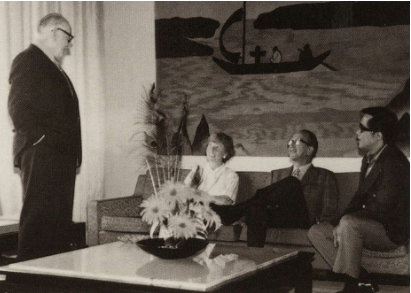 The company’s founding directors included friends and businessmen who had known each other in Shanghai before the war. 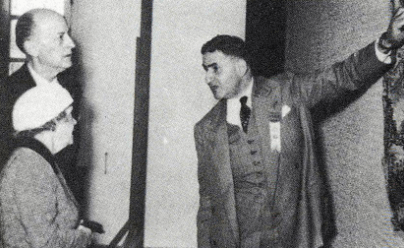 Lawrence and Horace Kadoorie had connections with Y.C. 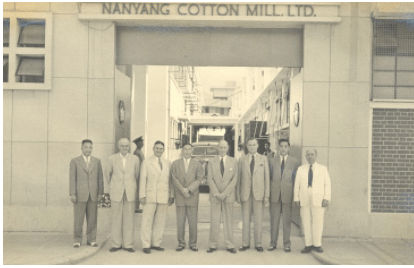 Wang and H.C. Yung (two immigrants from Shanghai) through Nanyang Cotton Mills, one of the first cotton spinning mills in Hong Kong which started operation in 1948. Lawrence Kadoorie (later Lord) was the company’s first Chairman. Another founding director was Tse Koong Kai (K.K. Tse), a senior executive at insurance giant AIA. 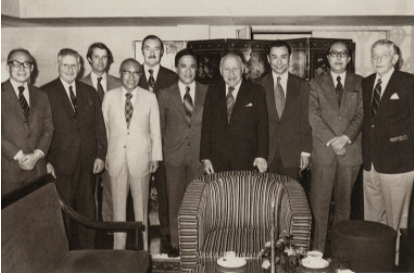 The company also had two American founding directors: Linden E. Johnson, who ran garment export companies in Hong Kong including Mandarin Textiles Ltd. based in Kowloon City, and the Los Angeles based super-salesman, Allen H. Rabin (Al Rabin). 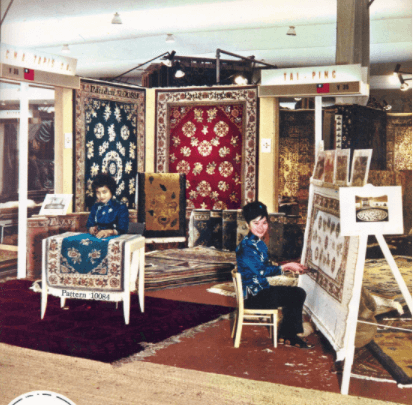 Both were quick to see the potential of selling luxury hand-made carpets ‘from the Far East’ to the booming U.S. consumer market. The group soon set about manufacturing Tianjin style knotted carpets under the ‘Tai Ping’ brand – meaning Great Peace – to appeal to overseas admirers of Oriental artistry. 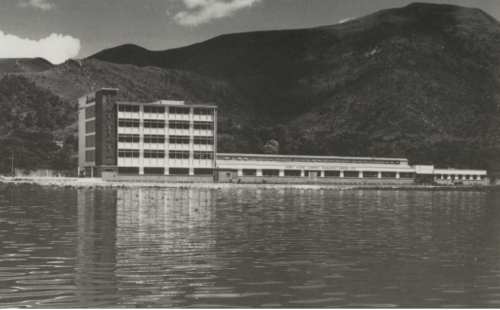 The company’s first make-shift workshop was established in 1956 in a two-storey villa in Tuen Mun, employing 32 workers and a supervisor. The workshop’s operations were soon expanded thanks to a large tent fitted over the concrete surface of a basket-ball court situated next door. The tent was bought from a visiting circus which had gone bankrupt while in Hong Kong (the tent has since been immortalised in the Tai Ping logo). Production started on a small scale at first. In a letter to his friend and business partner Al Rabin on 6 January 1956, Lawrence described initial progress and preparations for the workshop’s first VIP guest: ‘the following purchases have been made: properly seasoned timber – sufficient to construct 25 looms – is being delivered to the site. A Volkswagen bus will be delivered on Tuesday next … His Excellency (the Governor) and Lady Grantham will visit the factory on 21 January at noon, and I have been assured the loom will be set up so as to demonstrate how a carpet is actually made. It is intended that the carpets should be similar to the type you saw in Manila, that is, with the design embossed on the pile.’ When the time came for the Governor’s visit, only a very small piece of knotted carpet could be shown. 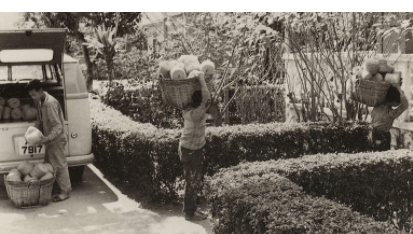 It quickly became apparent that hand-knotting was neither a widely held skill in Southern China, nor something that translated easily to the production line. This article was first posted on 1st February 2018.